Choosing to have your wedding at Ocean View Estate Winery & Restaurant means choosing tranquil, picturesque surroundings, a relaxed atmosphere in a beautiful building purposly designed for weddings with staff that care about your personal needs and a chef who will design a perfect menu to give your day that special touch. You will be surrounded by the romance of the vineyards and their seasonal changes. The gazebo on the lake will provide a perfect venue for photos, or the wedding ceremony itself and the vineyard cottages will give you, or your guests peace of mind and the convenience of staying the night in comfort and style. On your wedding day you will enjoy the ambience of our beautiful Cellar Door/Restaurant for your reception with views over the vineyards and lake. 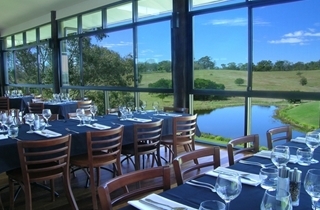 Our Chef has developed a menu to compliment our wide range of wines with many dishes incorporating the wines and ports. Our modern Australian Cuisine is full of flavour and changes seasonally to take advantage of seasonal produce and flavours. A three course meal with the first course being Anti pasto platters served in an informal fashion with drinks before being seated for an alternate drop of mains and desserts. Two mains and two desserts can be chosen. All packages include tea & coffee throughout the night (self serve), table set up on the day(not including decorations), all linen and cleaning costs (except in exceptional circumstances out of what can be expected). There is no room hire fee unless you require extra time (see extras on the day). We have minimum numbers of 70 adults on a Saturday night and 60 adults for exclusive use of our function room for other nights. A three course meal with Trio of Dips & 3 choices of hot canapes from the canapes list served in an informal fashion with drinks before being seated to an alternate drop main & dessert to be chosen. A four course meal with canapes & trio of dips being served in an informal fashion with drinks before being seated for an alternate drop of entrée, main and dessert. Three choices of canapes can be made from our canapes list and two choices of entrée, main and dessert can be made. A five course meal with canapes being served in an informal fashion with drinks before being seated for an alternate drop of entrée, main and dessert, followed by cheese & handmade chocolates. Five choices of canapes can be made from our canapes list and two choices of entrée, mains and dessert can be made from the attached list. Cheese and a handmade chocolate truffle each will be served on platters. Cocktail party with no formal seating arrangements and choice of nine substantial hot & cold canapes served as fingerfood throughout the event. Minimum numbers of 70 adults on a Saturday night and 60 adults for exclusive use of our function room on other nights. All packages include tea & coffee throughout the night (self serve), table set up on the day (not including decorations), all linen and cleaning costs (except in exceptional circumstances out of what can be expected). There is no room hire fee unless you require extra time (see extras on the day). We have minimum numbers of 70 adults on a Saturday night and 60 adults for exclusive use of our function room for other nights. 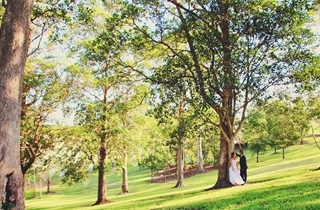 Our super value option giving you the opportunity to have your special day at Queensland's award winning winery location at a very affordable price. Available lunch time only (Mon-Thursday). Ceremony from 10am-11am, reception from 11am-3pm. Minimum numbers of 35 people apply on Monday, Tuesday & Wednesday. Reception is served in canapés style with scattered tables and some chairs available but no formal seating arrangement. This package applies to exclusive use of the verandah. 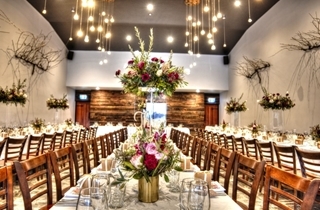 Other guests will be seated inside the restaurant away from wedding guests. This special excludes public holidays.